London, Feb 26 (IANS) The United Kingdom's government agency investigating a plane crash in the English Channel that killed Argentine football player Emiliano Sala said it would be scrutinising whether pilot David Ibbotson, who was still missing, held the correct licence to carry out the journey. The body of 28-year-old Sala was earlier this month pulled from the wreckage of the Piper PA-46 Malibu light aircraft, which crashed on January 21 just north of the Channel Island of Guernsey as it made it way from Nantes to Cardiff, but Ibbotson, 59, has still not been found. The search operation has since been called off. The UK's Air Accidents Investigation Branch (AAIB) said Ibbotson did not have a commercial pilot's licence, which meant he was not able to ferry passengers for money. "A PPL (private pilot license) does not allow a pilot to carry passengers for reward; to do so requires a commercial licence," the AAIB said in an interim report on Monday. "The basis on which the passenger was being carried on N264DB has not yet been established but, previously, the pilot had carried passengers on the basis of 'cost sharing'," it added. The report also revealed that the aircraft "was extensively damaged, and the main body of the aircraft was in three parts held together by electrical and flying control cables". "The engine had disconnected from the cockpit area, and the rear section of the fuselage had broken away from the forward section adjacent to the trailing edge of the wing. The outboard section of both wings, tail plane and fin were missing," the report added. A postmortem found Sala died from head and torso injuries. The report also found the plane rapidly lost altitude before the crash. The pilot's family, however, launched an initiative on the internet that managed to collect 250,000 sterling pound ($326,980) with the aim of resuming the search operations. 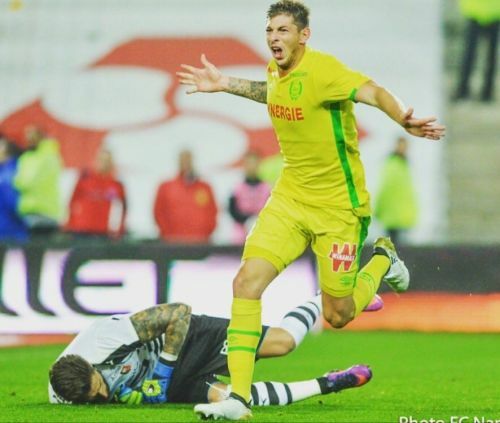 Sala left from Nantes heading to join Cardiff City, who paid a club record of 15 million sterling pounds ($19.63 million) to contract the forward, a player that had impressed European leagues and clubs during the first half of this season.